Ground molybdenum rod has good many good properties as molybdenum, such as high temperature, high strength, good thermal conductivity and low thermal expansion properties, so it is often made into high temperature products used in various high temperature fields. Molybdenum rod depending on the surface state can be divided into different types, including ground molybdenum rod, cleaned molybdenum rod, polished molybdenum rod and forged molybdenum rod and truing molybdenum rod. 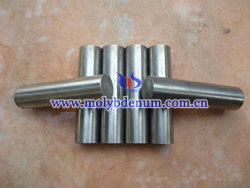 Polished molybdenum rod has deepest surface processing, showing bright and smooth surface color. Besides, the external and internal of product is densification and without cracks and other defects. Ground molybdenum rod surface shows silver gray metallic luster, smooth surface, small size error. Cleaned molybdenum rod surface shows gray metallic luster, smooth surface. Turning molybdenum rod surface shows metallic luster, smooth, but rough. Forged molybdenum electrode surface has oxide layer and the surface shows dark black. Sintered molybdenum rod surface shows gray metallic luster, but compared to the above surface smoothness of molybdenum rod is most rough. Molybdenum rod is usually produced by powder metallurgy method and the production processes are as shown below, powder mixed - milling - pressing - sintering - forging - machining. Molybdenum rod has excellent high temperature properties, so it can be made of the electrode material used in glass furnace for glass, refractory fiber and other products production.